Pop star Madonna and Sotheby's announced Wednesday the auction of a Cubist masterpiece by French artist Fernand Leger to support an education project for girls in Afghanistan and Pakistan. The painting "Trois femmes a la table rouge," estimated at $5 million to $7 million, will go on sale in New York on May 7, with proceeds going to the Ray of Light Foundation. Madonna, who has been made enormously wealthy through her pop singing career, said she wanted to help "countries where female education is rare or non-existent. I cannot accept a world where women or girls are wounded, shot or killed for either going to school or teaching in girls' schools." "I want to trade something valuable for something invaluable -- educating girls," she said in a statement. Madonna, 54, said selling the 1921 painting, that she bought at auction in 1990, combines her passions for art and education by raising funds for the Ray of Light Foundation. The painting will be auctioned by Sotheby's in New York during an Impressionist and Modern Art sale on May 7. The move comes as Madonna is in Malawi, southern Africa, home of her two adopted children, where her plans to build 10 schools have sparked controversy over costs and mismanagement and a project for a school for 400 girls collapsed last year. 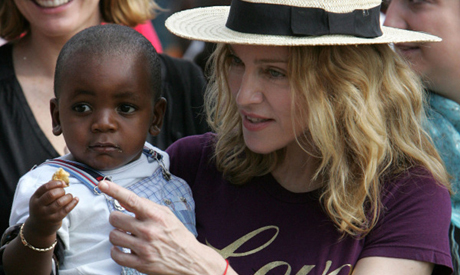 Madonna is not the only star seeking to take a role in boosting girls' education in developing countries. Earlier this week actress Angelina Jolie opened a girls' school in Afghanistan and announced plans to fund more by selling a jewelry line. Oprah has also been involved with building a school in South Africa although that project ran into trouble with a staff member arrested on charges of assault and abuse of students.